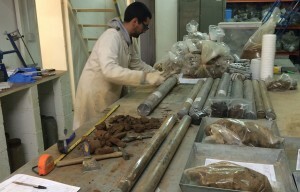 Our in-house soils and materials testing laboratory UKAS accreditation has been renewed for another four years, following a successful audit in March 2019. “The two-day audit is carried out every four years to ensure we continue to maintain the exacting standards of testing required by the United Kingdom Accreditation Service [UKAS],” said General Manager – Testing Services, Henry Chapman..
“Our laboratory is accredited to ISO/IEC 17025:2005 General requirements for the competence of testing and calibration laboratories. Accreditation has also been extended to include the calculation of the Uniformity Coefficient of granular material, using results from grading tests, which is commonly used in highways projects.”. Henry said he hoped that more accredited tests would be added this year and said the laboratory manual was also being re-drafted to meet the requirements of the recently updated BS EN ISO/IEC 17025:2017 General requirements for the competence of testing and calibration laboratories. This will be used to confirm the competency, impartiality and consistent operation of a laboratory going forward from 2019 and beyond through UKAS..
For more information go to https://harrisongroupuk.com/soil-testing or contact Henry Chapman on 01603 613111.